The air is crisp and cool in Austin–– you’re headed to the park with a couple of bikes, a few friends and a bundle of Roos. You set up camp, wrap up in a blanket and enjoy the playful sound of laughter alongside the beat of a drum. It’s evenings like these that you can’t help but admire nature and its ability to inspire such sincere moments. Here at Kammok, we love and cherish these places too. We believe adventure can change lives, outdoor exploration should be enjoyable for all, and stewardship must be prioritized on every journey. When we work together, we can both enjoy and care for our favorite parks, trails and beaches. That’s why our values are not only woven into our company culture, but they are also intentionally woven into our gear. 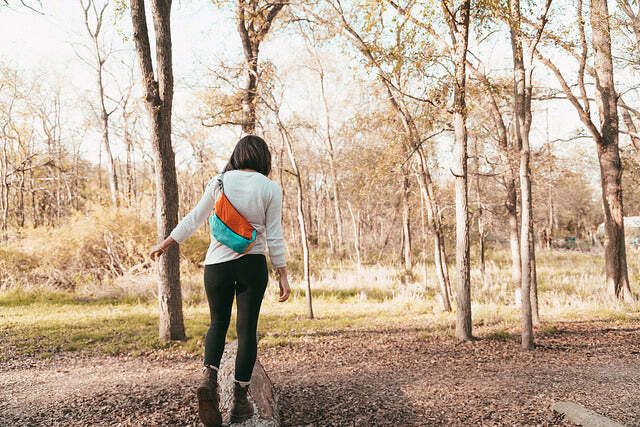 We've thoughtfully designed our gear to be both tree-friendly and durable so you can adventure responsibly. We aim to equip you to be the best steward you can be. 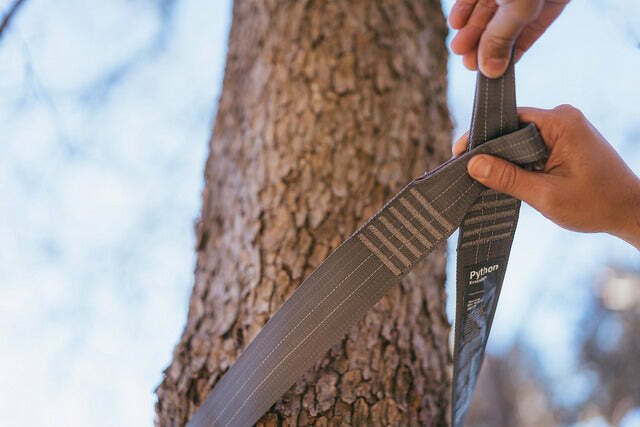 That's why we've designed tree-preserving straps for our hammocks. Thousands of trees are damaged every year from chain or rope straps that strip tree bark and wear into the outside of the trunk. Our new Python 10 and 15 straps with variable width polyester webbing displace pressure on trees, minimizing a hammock camper's footprint on nature. Our Python Extenders have a width of 2-inches, which provide better tree protection and meet most park requirements on hammock straps. We’ve designed them thoughtfully and encourage you to take care in choosing your site and following basic Leave No Trace principles. We want our gear to allow you to enjoy the environment, not harm it. We’ve also built our gear to last. This not only increases its usable life, but it keeps fabric out of landfills and waterways. All too often, cheaply made fabric falls apart and is quickly disposed of. We don’t want you or Kammok to be a part of that story, so we are constantly looking for ways to strengthen our gear and recycle it responsibly. 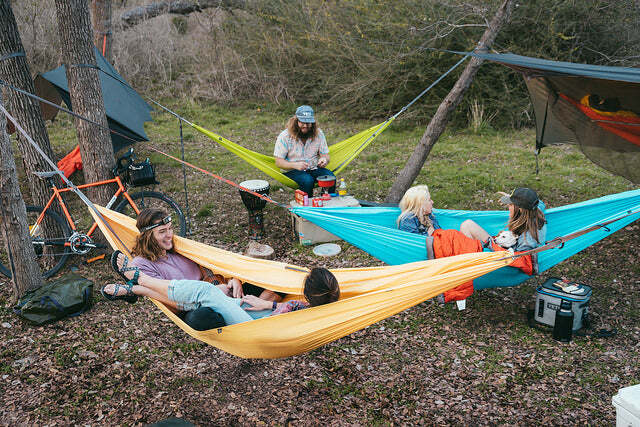 Our Roo features high-tenacity LunarWave diamond ripstop nylon, which protects against tearing and ripping and has the highest weight capacity (500 lb) of any hammock in its category. If cared for, your Kammok gear will last a lifetime. For products at the end of their usable life, we promise to properly reuse or recycle them for you. We’ve even reduced our excess material waste by designing up-cycled totes and packs from the leftover scraps from our hammock manufacturing. We keep looking for ways to close the loop, so you can keep adventuring with little to no environmental impact. Let’s Take Action & Explore! You’ve got gear designed with nature in mind. What’s next is continuing to be intentional every time you step out the door and caring for your gear to extend its life-cycle. 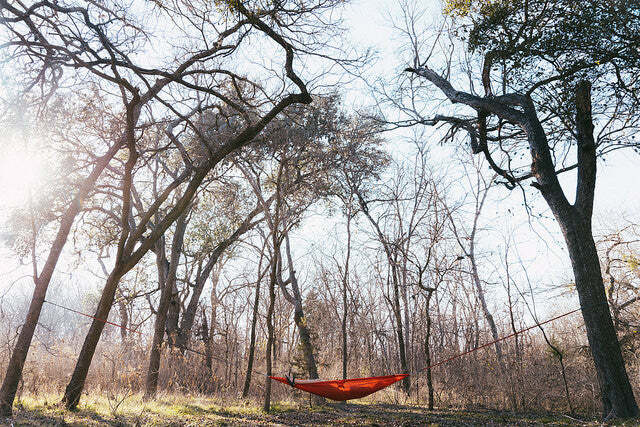 When hammock camping, keep checking for delicate wildlife and camping in areas that aren’t sensitive. Patch up your overused gear, and avoid leaving it in the sun when not in use to preserve our durable nylon. Our products are designed for you to leave no trace when you hammock camp, so just keep on exploring, with values in mind.